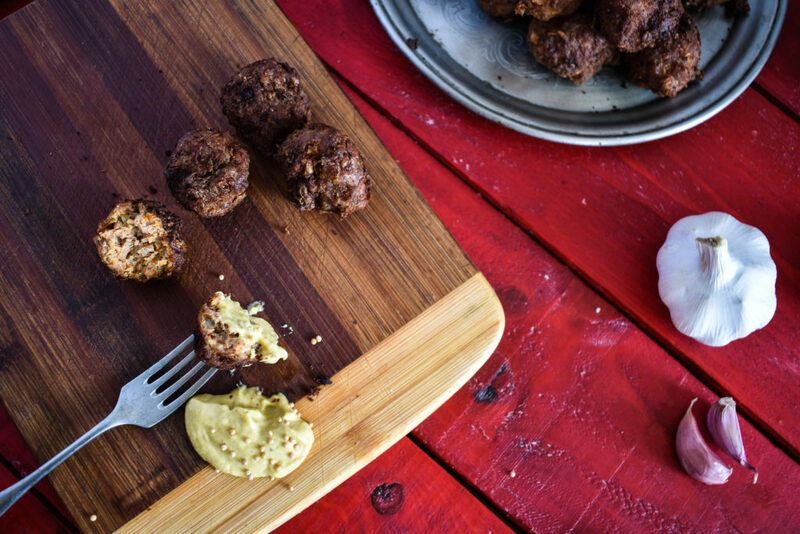 The possibilities to make meatballs are as endless as making pizzas. In fact, there is no end to it, ever. We can vary the ingredients or the preparation method and as long as we end up with ball shaped, meat consisting things, we are still in the meatball realm. The best thing with meatballs is their versatility though. Despite being perfect for the dinner table, bitten from the point of a fork, it amazingly fits for picnics, as well. Not to mention parties where it only needs a few toothpicks to be socially enjoyable without greasing our fingers and smudging it all over the champaigne glasses. Sticking them up, provides further colorful pleasantries to be added to the bite like cheese, pepper, olives and so on. The worst thing in meatballs is that the smallest they are the better they taste. This means we have to labor fairly much to create perfectly looking delicious bites from a big shapeless mass. There are times when cutting up a bigger ball into smaller parts would do the trick and the difference would be negligible, like stuffing a sandwich with sliced meatballs but the rest of the occasions requires patience and resilience. Luckily, it’s not that hard as chiseling them out of solid rock and a pair of oily or watery hand would quickly able to churn out a few dozens from them. 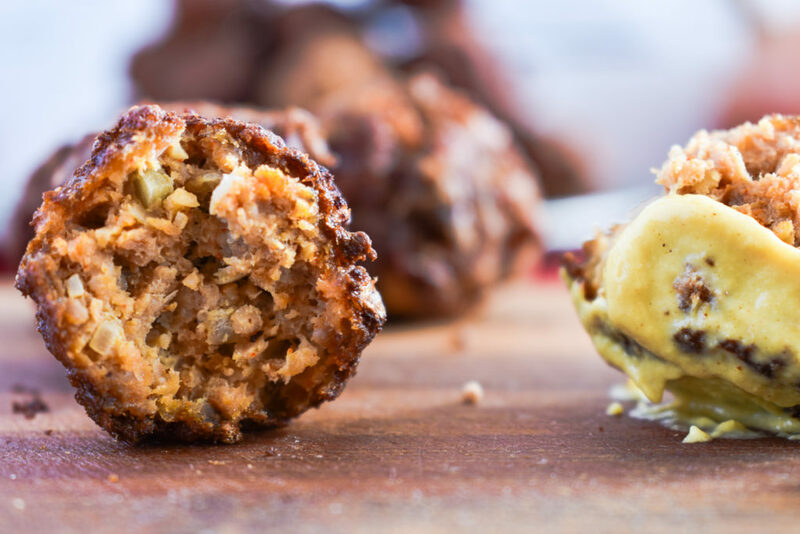 The difference between an OK meatball and a can’t stop eating meatball is, the spices that are used to flavor them. At first, try it’s essential to write down exactly what and how much we used of the ingredients as this will help us next time adjusting the amounts of each spices. This is the kind of dish that almost never works out just perfect for the first time but gets better the more we prepare it. 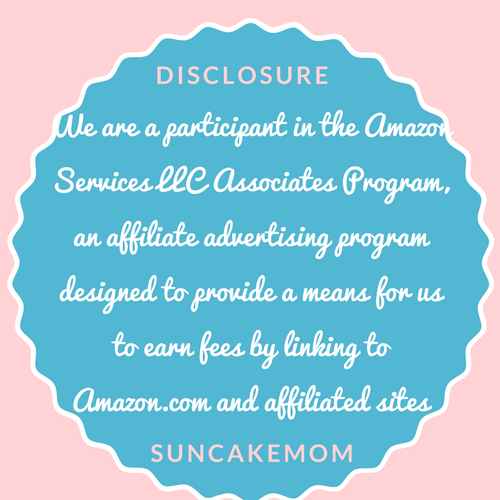 Try with smaller amounts first to find the perfect ratios and work our way up from there. 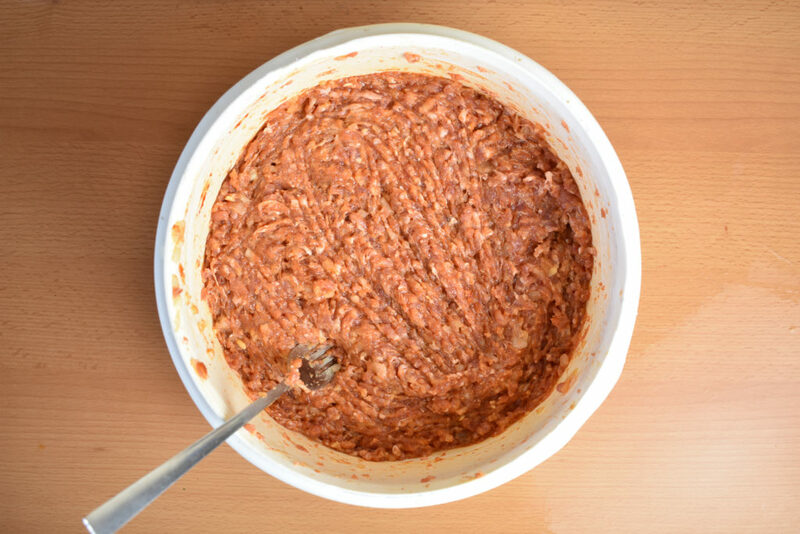 In this recipe we use only some basic ingredients like salt, onion, garlic and our favorite paprika. 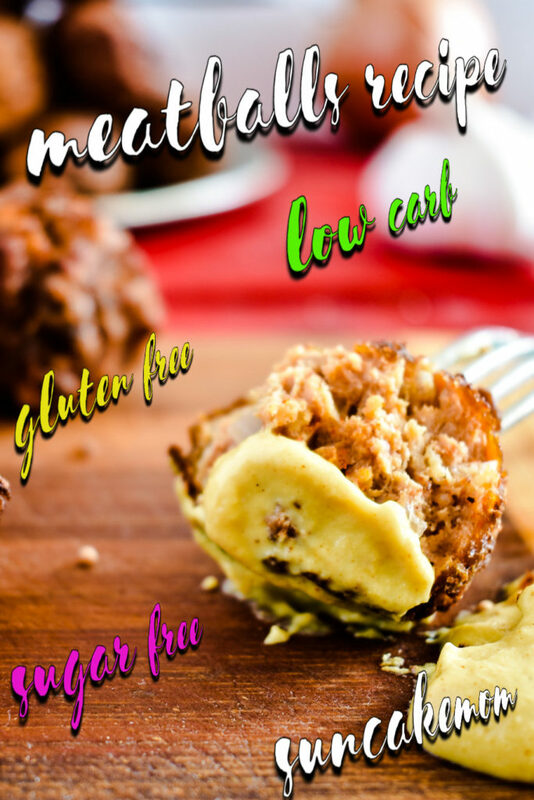 Many recipes use carbs, to expand the volume of the meat like bread, breadcrumbs or rice but this is a low carb meatball recipe so we skip on carbs, now. 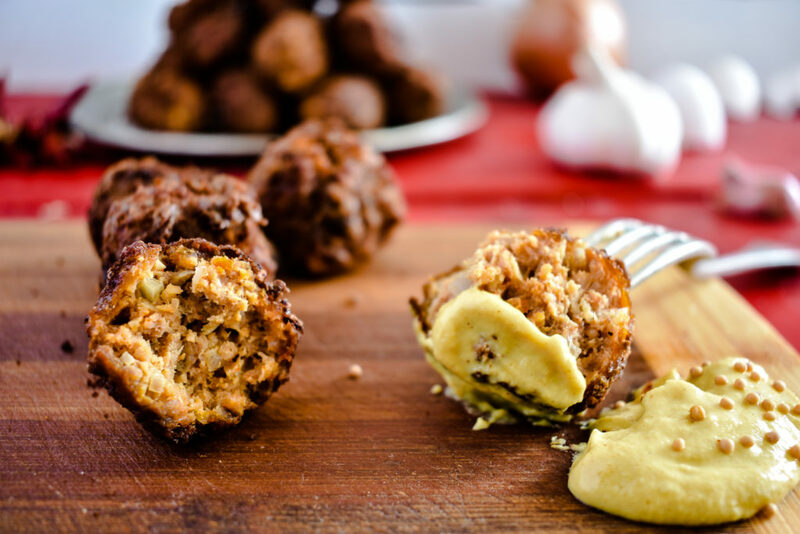 We also omit rolling the meatballs in breadcrumbs as some recipes require which essentially would change the outer texture of the meatballs but otherwise not necessary at all. So, when we get rid of gluten, carbs and do not add any dairy to our patty, we are ready to form and cook our very own low carb meatballs in various ways. There are various ways to do this, including cooking in some sauce or water like this gluten free meatballs with tomato sauce or just placing them onto a baking tray and tossing them into the oven for an hour or so. Oven baking takes much longer than submerging them into hot oil though. Well, it depends on the number of meatballs, we prepare as the oven can take up much longer time than our deep fryer or even a largish frying pan. 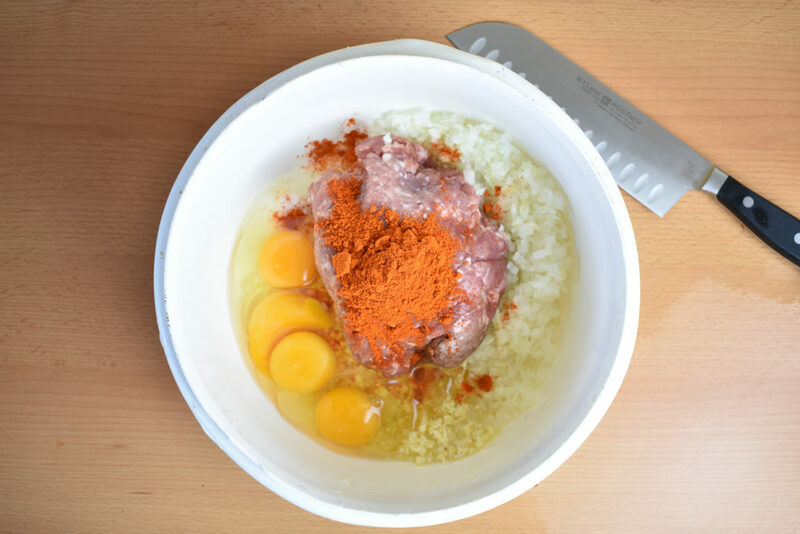 When cooking pork, the general recommendation is, to cook it until the internal temperature of the meat reaches 70°C then let it cool for 3 minutes. Reaching the required temperature happens fairly quickly though. Much faster than we can get a nice golden-brown color on our meatballs. So, if we have golden brown meatballs just cut up one, to see if there is no visible pink meat inside and we are good to take them out. In case the outer side of the meatballs are brown and the inside is still pink in means we fry them on too high temperature. 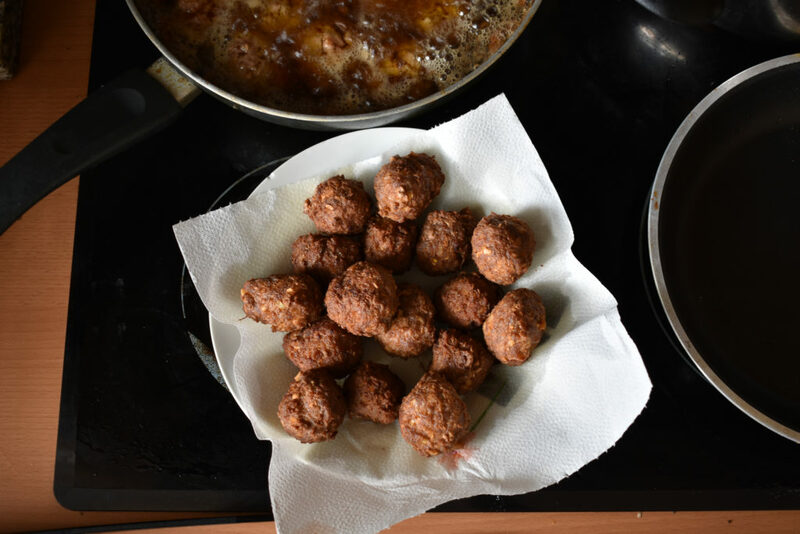 A not too tightly packed batch of meatballs should be ready on medium to high temperature in a 10” / 30cm frying pan in about 15 minutes. Place all the ingredients in a big enough bowl. 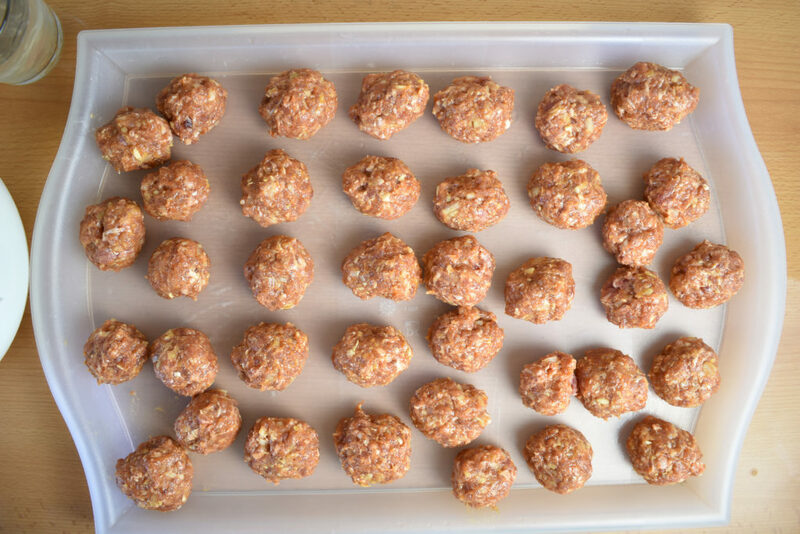 Form balls out of the meat and spice mixture. Smaller are tastier bigger are easier. Find the golden way around Ø1½” / Ø3.5cm. Heat oil in a pan deep fryer or preheat the oven to 350° / 180°. Place the balls into the oil or the oven and take them out when golden brown. 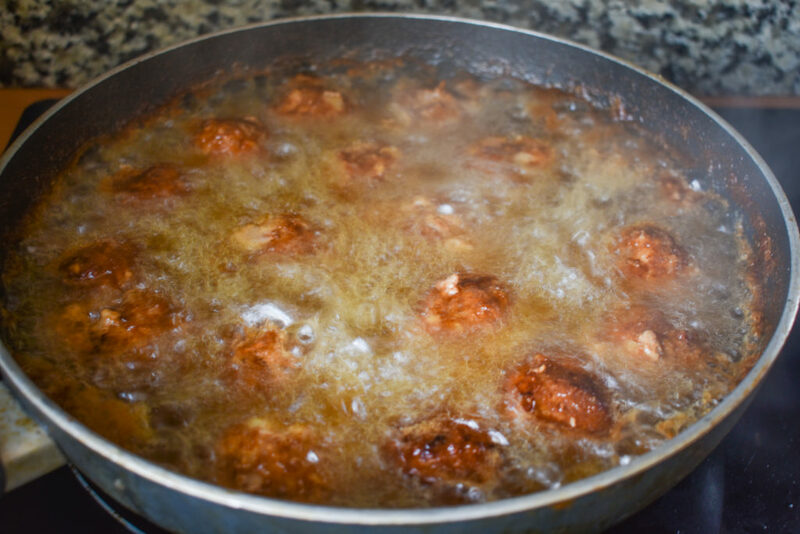 Frying meatballs in oil will get them ready in about 10 minutes while in the oven it takes about 50 min. Mix all the ingredients together in a big enough bowl. Form balls out of the meat and spice mixture. Smaller are tastier bigger are easier. Find the golden way around Ø1½" / Ø3.5cm.